There’s a big festival happening in just about every region of the country this summer. 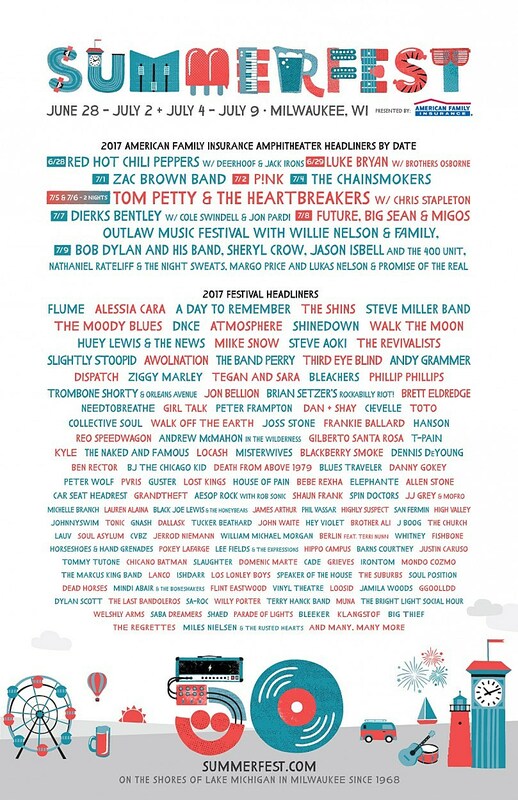 For the midwest, there’s the 50th edition of Milwaukee’s Summerfest on June 28-July 2 and July 4-9. It includes the previously-announced American Family Insurance Amphitheater stops of the Tom Petty & the Heartbreakers tour (with Chris Stapleton), Willie Nelson‘s Outlaw Music Festival Tour (with Bob Dylan, Jason Isbell, Margo Price, and more), and the Red Hot Chili Peppers / Deerhoof tour. It also includes a newly-added American Family Insurance Amphitheater stop to the Future/Migos tour, with Big Sean on that bill as well. As always, the lineup is super diverse. Other acts playing this year include P!nk, The Shins, Death From Above 1979, The Moody Blues, Michelle Branch, Steve Aoki, Atmosphere, Huey Lewis & the News, Car Seat Headrest, Third Eye Blind, Big Thief, Flume, Tegan & Sara, Peter Frampton, and still so much more. Also, Hanson will be there. The whole lineup is listed below. Tickets for a variety of pass options are on sale now. Note that if you wanna see some of the bigger headliners performing at American Family Insurance Amphitheater, you have to purchase a different ticket. Those tickets are available here.